Today I want to talk a little bit about a man you may or may not know, who, in many ways epitomizes the Gold Rush era for me. His rise to riches and fall into poverty were spectacular, but regardless of his station in life he stirred the hearts of San Franciscans. His name is Joshua Abraham Norton. Born in England he grew up in South Africa where his father made a considerable fortune as a merchant. Upon his father's death, Joshua inherited about $40,000, (which in today’s currency would be about $1.2 million.) He quickly jumped on a ship for San Francisco in 1849, where he became a successful businessman, making and profiting from extensive real estate investments. He saw a chance to make a big killing by cornering the rice market during the Chinese rice famine when the price of rice in San Francisco soared to 36 cents a pound. He bought an entire shipload of 200,000 pounds of rice already on the ship Glyde, en route from Peru in San Francisco harbor for $25,000, or about 12.5 cents a pound. Unfortunately, just after he signed the contract, several other ships loaded with rice sailed into San Francisco Bay. The price dropped to 3 cents a pound and Joshua found himself with a big loss. He tried to get out of the contract, claiming he’d been misled about the quality of the rice. After long court battles he lost, and the banks started foreclosing on his real estate holdings to pay his debts. In would appear his losses weighed heavily on his mind. He disappears from view for a few years, but in 1858 he was living in the Exeter Lodging House, a working class boarding house. Then, on September 17, 1859 he issued letters to San Francisco newspapers proclaiming himself Emperor of the United States. Emperor Norton issued many other decrees during his 21-year reign. On Oct. 12 1859, he issued a decree formally abolishing the United States Congress. Among his other decrees included one calling on the army to “clear the halls of Congress”, another abolishing both Republican and Democratic Parties and a third ordering the construction of a suspension bridge or tunnel connecting Oakland and San Francisco. Does that sound familiar? Wearing a blue uniform with gold-plated epaulets donated by the officers at the Presidio, and a beaver hat with a rooster feather in it and a rosette, Emperor Norton was frequently seen walking the streets of San Francisco with two loyal dogs “Bummer” and “Lazarus”, inspecting the public works. For two decades the people of San Francisco loved his eccentricities. He often dined for free in some of the city’s best restaurants whose proprietors welcomed him for the publicity value. Subsequently he also took the title “Protector of Mexico”. In the census of 1870 he was said to be 50-years-old, residing at 624 Commercial Street. His occupation was listed as “Emporer”. It was also noted he was insane. But was he? On January 8, 1880 he collapsed and died in front of Old St. Mary’s Church on the corner of Dupont and California streets. Nearly 30,000 San Franciscans attended his funeral. He left a legendary legacy that lives on to this day. There was even a campaign to rename the Bay Bridge the Emperor Norton Bridge. 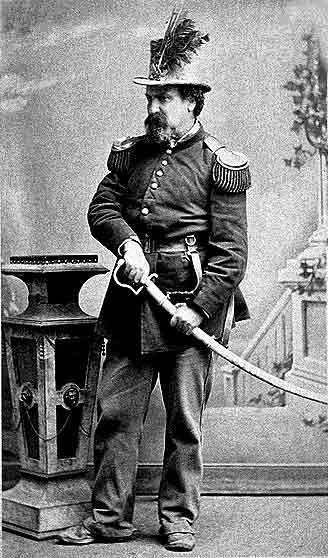 Although details of his life story may have been forgotten, Emperor Norton was immortalized in literature. Mark Twain, who resided in San Francisco during part of Emperor Norton's public life, modeled the character of the King in "Adventures of Huckleberry Finn" on Emperor Norton. AVailable now on Kindle and Amazon.com. In bookstores this week. 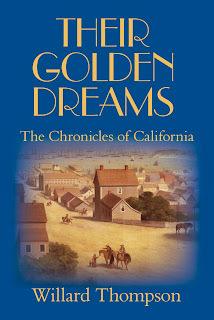 Their Golden Dreams follows the lives of men and women who were thrown together in the rough and tumble days of the gold diggings of the southern mines of California. Most didn’t stay long and when they left – richer or poorer than when they came – they started exciting new lives you won’t want to miss. 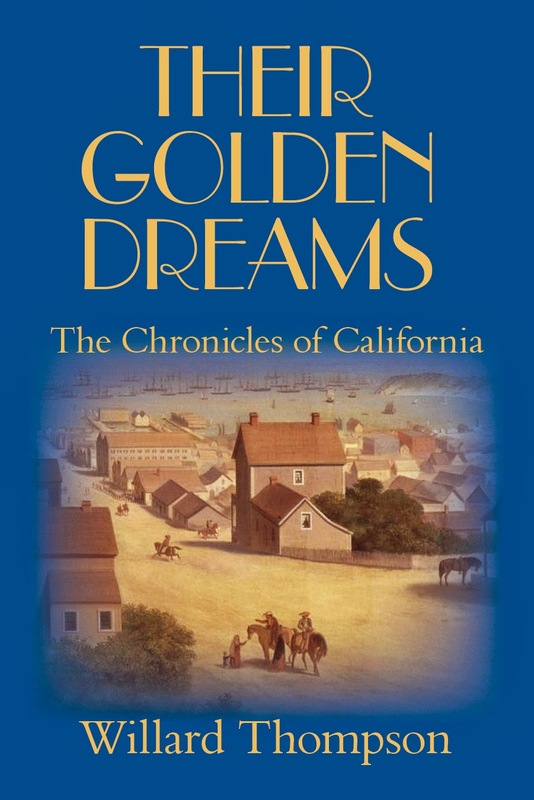 Their Golden Dreams is the third novel in Willard Thompson’s Chronicles of California series. In each novel Thompson seamlessly layers accurate California history with adventurous plots and characters so real you live their lives with them. Dream Helper, A novel of Early California, and Delfina’s Gold are other novels in the Chronicles series. They’re all available at local bookstores, at Amazon.com, on Kindle and other electronic readers. Don’t miss any of these exciting novels. Willard Thompson is an award-winning writer, lecturer and historian. The Independent Publishers 2009 Book Awards selected Dream Helper for a gold medal as the best fiction in the Western/Pacific Region. Thompson also writes historical nonfiction available at bookstores, Kindle and other electronic reading devices. ORDER YOUR SIGNED COPY OF THEIR GOLDEN DREAMS DIRECT FROM RINCON PUBLISHING WITH FREE SHIPPING. 2. Include your email address in the body of your email to Willardthescribe@gmail.com and we will send you a PayPal invoice for $20.00. WHAT EVER WAY YOU CHOOSE BE SURE TO INCLUDE YOUR MAILING ADDRESS AND ANY SPECIAL INSCRIPTION YOU WANT IN THE BOOK. When President James K. Polk stood before Congress in December 1848 and announced to the world that gold had been discovered in California’s foothills, holding a tea caddy with more than 230 ounces of it as proof, he kicked off, arguably, the most legendary voluntary migration of people the world has ever known. Adventurous men from around the globe – Mexicans, Europeans, South Americans, Australians and hardy Yankees – streamed to California to claim their share of the precious metal. Most of them traveled to the gold fields by sea. For the Gold-Rushing Argonauts of 1849, California was a long way from anywhere. Adverse winds and violent storms could delay them for weeks if they sailed around Cape Horn. Overland travel could take longer and had its own perils. There was one other way to get to the gold fields: travel by steamship down the Atlantic Coast to Panama and a hike across the Isthmus to catch a second steamer to the diggings. In my new novel, Their Golden Dreams (available May 1 on Kindle and Amazon.com) I trace the progress of two daring young women as they travel the Panama route. Almost by accident, that route became a thriving enterprise for a not-so-well-known American entrepreneur by the name of William Henry Aspinwall. At the age of 25, William Aspinwall emerged as leader of family trading company, Howland and Aspinwall in 1834. With him at the helm, the company grew. Its ships, with the blue and white company flag at their mastheads, sailed to London, Liverpool, the Mediterranean, Caribbean, South America, and across the Pacific to Canton, China. At that time, sailing vessels were virtual general stores, sailing from port to port, trading one cargo for another and moving on to the next port on voyages that might take two or three years before returning home. But maritime times were changing, and Aspinwall saw the future. It was speed that counted, not the port to port meanderings of heavy laden ships, but speed from home to a foreign port loaded with cargo and a speedy return home with another cargo. In 1843, Aspinwall approved a radical design from Naval architect, John Willis Griffiths, for the first clipper ship, Rainbow, a longer, leaner, taller-masted ship than most conventional vessels. The clipper ship returned double her cost on her maiden voyage. In the mid 1840s national affairs intervened to change the course of William Aspinwall’s career, and bring California and Oregon more firmly under U.S. control. In 1847, before the end of the Mexican War, Congress granted two U.S. mail subsidies: one down the East Coast to Panama and the other from Panama’s Pacific coast to Oregon with a stop in San Francisco because it strengthened our hold on Oregon. Aspinwall bought the contract for the Panama to Oregon, but he wasn’t sure if it was a good investment or not because there were few profit port calls along the way. He ordered three small steamships built: two, “California and Panama, from the William Webb shipyard and a third, Oregon from The Smith and Dimon yards. They were side lever paddlewheel ships of about 300 tons and 200 feet in length, each costing about $200,000. The California was the first to leave New York to take up station in Panama. While she had a passenger capacity of 60 in cabins, she left on October 6, 1848, before Polk’s startling announcement, with just seven passengers on board. California discovered it had a cracked crosshead, a mechanism used in large reciprocating engines to eliminate sideways pressure on the piston, the first day out. Each day thereafter, captain and crew identified other problems in the brand new ship. But the ship traversed the Straits of Magellan, around Cape Horn, and stopped in Valparaiso, Chile, and Callao, Peru, before heading to Panama. California was unaware of what awaited her and her crew in Panama City. On December 30, the New York newspapers had reported that the offices of Howland and Aspinwall had been overrun the entire month with Argonauts clamoring for passage. When California arrived in Panama she was met by total chaos. The Rush was on. Accounts vary, but there were at least 1,500 people waiting to board the steamer for San Francisco. 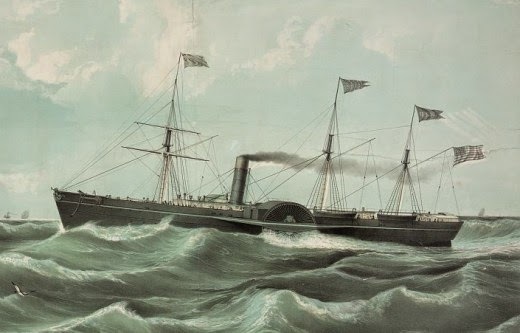 When California finally left Panama on January 31, 1849 she carried about 375 passengers lucky to have won a lottery for space on the steamer, leaving behind a large gathering of angry Americans waiting for the next ship. The Oregon heaved anchor in New York on December 22, 1848 and the Panama followed on February 17, 1849, but it would be over a year before the backlog of gold seekers waiting in Panama would all find passage to San Francisco. When California had stopped in Callao on the way north, she loaded 17 Peruvian miners bound for San Francisco. Arriving in Panama, Americans anxious to get to the diggings wanted them thrown off the ship. An U.S. Army general heading for Oregon thought the Peruvians should be dragged off the California. He declared in the Panama newspaper, “…nothing can be more unjust and immeasurable than for persons not citizens of the United States… to dig the gold found in California…” By order of the U.S. Consul in Panama, who happened to be a Pacific Mail Steamship Company agent, the Peruvian miners were allowed to continue to San Francisco. The mob of would-be miners waiting for transportation to San Francisco had made the journey across the Isthmus of Panama from Charges, a city described as “a collection of hovels; muddy, hot, odorous, and hard pressed by the tropical jungle.” Discharged from the Atlantic steamers at Charges, the Argonauts made their way by canoe, mule and on foot toward Panama City on the Pacific coast. Jessie Benton Frèmont was one of the early travelers to cross the Isthmus. She was on her way to meet Pathfinder husband, John Charles Frèmont, in San Francisco, from whom she’d been separated for over six months. Although a woman of privilege, due to her husband and father, Senator Thomas Hart Benton, Jessie endured many of the hardships of the journey. (To learn more about this amazing young woman read John and Jessie Frèmont: The Couple Who Won the West and Lost Everything Else available on Kindle click click here. Ahead lay Panama City, a city of narrow streets, balconied homes and ornate cathedrals and churches, crowded with gold seekers waiting for a ship. It was also a breeding ground for any number of diseases. Cholera and malaria were rampant. Jessie Frèmont contracted “Brain Fever” in Panama City. American and Spanish doctors debated her treatment. “The two physicians, with their contradictory ideas and their inability to understand each other, only added to the confusion of my mind, and became part of my delirium,” she wrote. Because she was a woman traveling with a young child, nationally known and recovering from her sickness, she was one of the lucky ones who were granted passage on the next available ship. Finally, California limped into San Francisco Bay San Francisco on February 23, 1849 to a booming 21-gun salute from the six ships of the Pacific Naval Squadron anchored there. Over the years, the Pacific Mail Steamship Company carried thousands of men and women to San Francisco, creating a thriving new business for William Aspinwall, but he almost immediately saw that transportation from the Atlantic port of Chargas, across the Isthmus to Panama City had to be improved. The new location of the Atlantic jumping off place for the railroad he was building was called Manzanillo Island, “a 650-acre, coral-ringed, morass of seaweed, mangroves, and flotsam infested by alligators, snakes, mosquitoes and sand flies.” At high tide it was underwater. The roadbed was built over swamps and quick sand and mud, progressing westward at a snail’s pace. At the same time, competition, described as “bitter and ruthless”, was developing. The most troublesome competitor was Cornelius Vanderbilt, who announced plans to build a competing route across Nicaragua. By 1851 he had ships on both coasts and an easier crossing via the San Juan River and Lake Nicaragua. The total time from New York to San Francisco was shortened on Vanderbilt’s route, putting Aspinwall’s Panama hope in great jeopardy. But luck was on his side. In December 1851, two of the U.S. Steamship Company’s steamers, with over a thousand passengers, arrive at Charges in a terrible storm. Several passengers were drowned trying to disembark. Remaining passengers heard the steam whistle of a Pacific Railroad engine and demanded to be taken to Manzanillo Island. There, they demanded transportation across the Isthmus. The new railroad, still abuilding, had no passenger cars and only eight miles of track, but the local manager agreed to take the travelers for fifty cents a head and $3 per pound for their baggage. In all, 1,100 people paid up and clambered about the railroad’s flatcars. When news reached New York, the U.S. Line shifted its Atlantic port from Charges to Manzanillo Island, soon to be renamed Aspinwall, and the railroad’s future was assured. The first train to run from Atlantic to Pacific across the Isthmus of Panama made the trip on Sunday, January 28, 1855, and from that time on contributed large profits to William Aspinwall’s fortune. But he didn’t attend the opening ceremonies that Sunday. He arrived a few days later to inspect the railroad and board a new, larger steamship, John L. Stephens, for San Francisco. It was the first and only time Aspinwall ever visited Panama or California. I write and publish both historical fiction and non-fiction articles and books about Western America. Dream Helper, my first historical novel, won a Gold Medal from the Independent Book Publishers Awards. As a member of the Santa Barbara Historical Museum and Santa Barbara Maritime museum, where I am on the Board of Directors, I wrote Keepers of the Light, The HIstory of the Point Conception Lighthouse for the opening of the magnificent Fresnel lens exhibit you can visit in the Santa Barbara Maritime Museum.